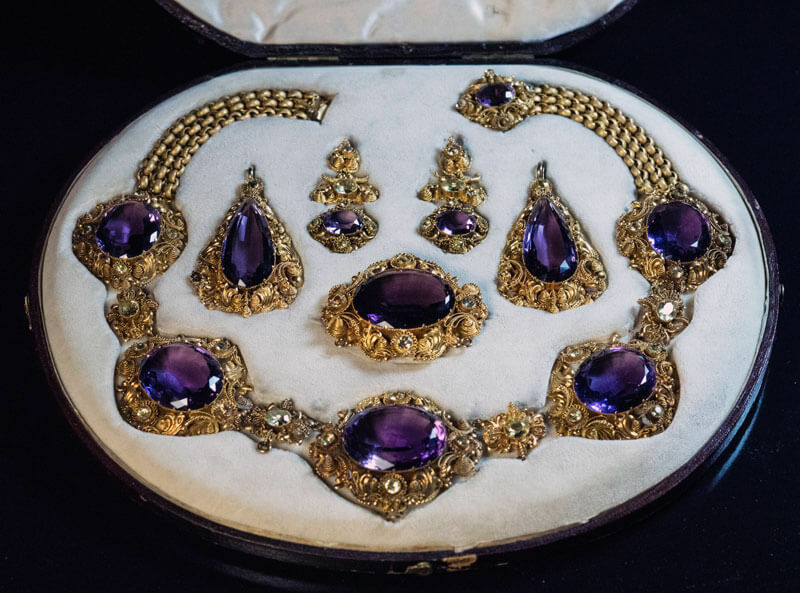 This magnificent antique parure from the late Georgian era, circa 1830, features large faceted amethysts accented by green chrysoberyls set in ornate filigree 15K gold settings. The parure (early 19th century French name for jewelry sets) consists of a necklace, a brooch, a pair of clip-on ear pendants, and a pair of large drop-shaped pendants which can be attached to the necklace or the brooch. Closures of the ear pendants have been replaced by 9K gold clip-ons in the early 1900s. The leather presentation box is also from the early 1900s. The center amethyst of the necklace measures 30.4 x 25.5 x 15.2 mm, and is approximately 62.45 ct. Estimated weight of other amethysts in the necklace: 33.76 ct, 34.25 ct, 25.36 ct, 25.49 ct. and 4.59 ct. 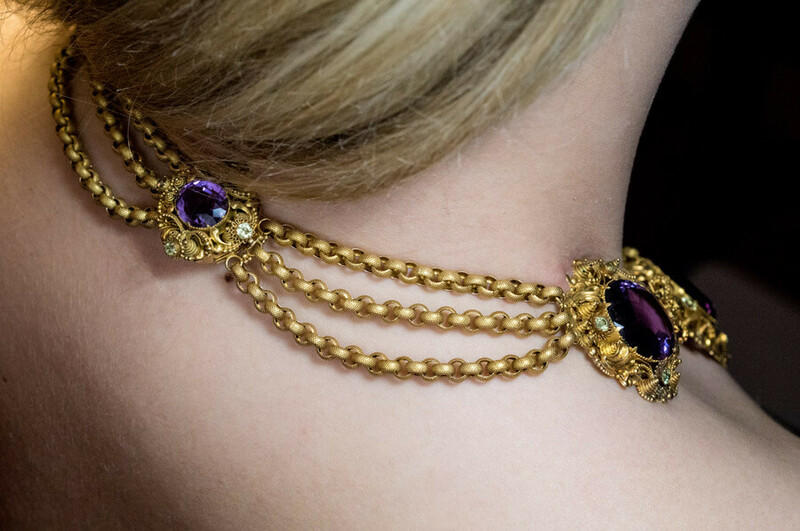 Approximate total weight of the six amethysts of the necklace (without detachable pendants) is 185.90 carats. 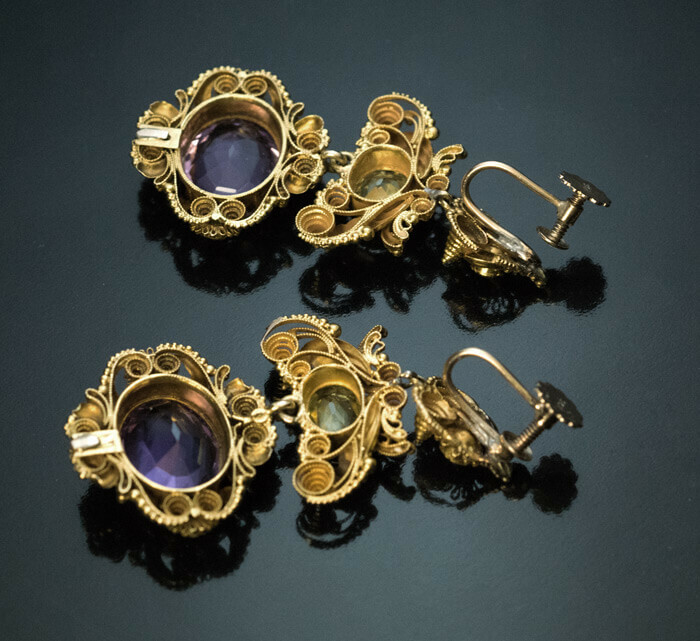 Estimated weight of the two pear cut amethysts of the pendants: 24.43 ct and 24.80 ct. The amethyst of the brooch is approximately 40.32 ct. Estimated TOTAL amethyst weight is 284.36 cts. Weight of the necklace 114 grams. Weight of the ear pendants 7.2 grams each.